Summary THE FINEST HOURS is a US period drama, based on a true story, about an attempt by members of the US Coastguard to save the lives of a group of sailors trapped on board a stricken ship during a violent storm. 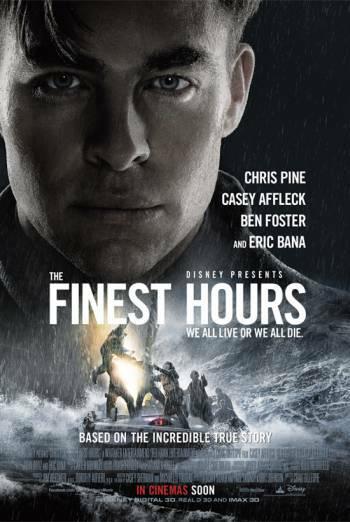 THE FINEST HOURS is a US period drama, based on a true story, about an attempt by members of the US Coastguard to save the lives of a group of sailors trapped on board a stricken ship during a violent storm. There are several prolonged and intense scenes in which characters on board the lifeboat or stricken ship are in danger. In one scene, a sailor is dragged to his death after plunging overboard, while other scenes show sailors falling from a height in the engine room, being struck by a metal girder or crashing against the ship's hull. However, injury detail is limited. There is also some mild bad language ('screw you', 'hell', 'Jesus', 'God', 'goddamn').